LifeSpan is an optimal blend of the purest cold water Salmon Oil and is further supplemented with Co-enzyme Q10 (CoQ10) to support healthy heart, joint and muscle functions. Our goal at Evolution Pets is to create a natural product line for pet health care that is safe and effective for your canine. We believe in using valuable homeopathic solutions to help your pet restore its natural balance. Evolution Pets has helped canines around the world to live long healthy lives. Our products are made with love and manufactured here in the United States and eco friendly. LifeSpan Salmon Oil Offers The MAX Salmon-Fish With CoQ10! LifeSpan Salmon Oil supplies the perfect blend of Omega Fatty Acids needed in a dog's diet. Based on recommended daily dosage guidelines, LifeSpan provides approximately 1000 to 4000 milligrams of Omega 3 Fatty Acids. LifeSpan Can Be of Help To Dogs With Arthritis and Support A Healthy Immune System! LifeSpan Salmon Oil also optimizes the amount of Omega-6 linoleic acid which has been shown to help with arthritis, joint pain as a result of aging, improved immune system response, and healthy heart support. LifeSpan provides approximately 190 to 760 milligrams of Omega 6 Fatty Acids. How Can LifeSpan Salmon Oil Help My Dog With Inflammation? LifeSpan provides a great combination of EPA and DHA which contains 2 active omega's: EPA (eicosapentaenoic acid) and DHA (docosahexaneoic acid). The Journal of Veterinary Research suggests that as part of a dog's daily supplemental intake EPA and DHA be included. They work to help reduce inflammation and have been shown to help with various inflammatory conditions. Note: EPA has been shown to help arthritis by reducing cartilage damage. DHA has also been shown to support brain function in both puppies and older dogs. Easy to Use with No Mess. Life Span comes in a clean and easy to use squirt bottle. What Sets LifeSpan Salmon Oil Apart From Other Salmon Oil Products? Only Salmon Oil Formulation with CoQ10! From the Cold, Pure Waters of Iceland! LifeSpan is an optimal blend of the purest cold water Salmon Oil and is further supplemented with Co-enzyme Q10 (CoQ10) to support healthy heart and muscle functions. This is an all natural product and is a great daily supplement for dogs and cats. 16 ounce bottle with easy to use pump top. Will My Dog Like The Taste? As LifeSpan Wild Alaskan Salmon Oil for Dogs is all natural and contains no artificial preservatives dog's and cat's generally love the taste and will have no issues taking it in. If your loved one is a bit picky, no need to worry, simply introduce it slowly over a weeks time. One they are acquainted to the taste they should enjoy taking it. What Health Benefits Does LifeSpan Offer My Dog? LifeSpan Salmon Oil will help keep your pet's coat and skin healthy and great looking. Your dog's coat and skin are greatly affected by fatty acids in their diet. If the amount and ratio, of Omega 3 and 6 fatty acids is off, your pet can experience a host of skin problems to include excessive itching and scratching, hot spots, shedding, and even dermatitis. LifeSpan will help re-balance these fatty acids to improve the health, feel, and shine of your dog's coat! Numerous studies support a ratio of Omega 3 to Omega 6 fatty acids in the range of 1:3 to 1:6. What Do Dog Owners Say About LifeSpan Salmon Oil? We've been using LifeSpan Salmon Oil for Dogs for 6-months now and we could not be happier with the results. We switched from another well known salmon oil, and we notice a big difference in our dog's mobility and overall energy level! -John, Charlotte, NC. 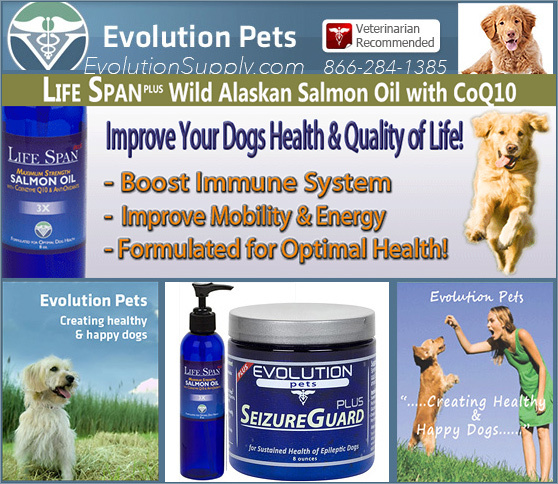 Call Evolution Supply and Let Us Tell You How LifeSpan Salmon Oil Can Help YOUR Dog! Evolution Supply is committed to providing the best health supplements and nutritional support available. We want to hear from you! Call us TODAY and tell us about your dog!